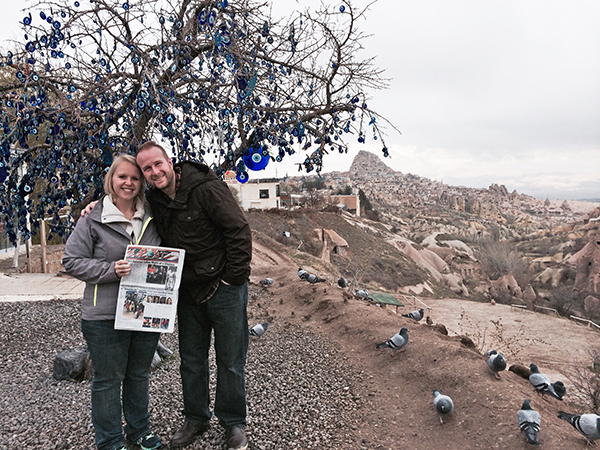 Rachel and Josh Hunt in the region of Cappodocia, Turkey. Rachel and Josh Hunt recently traveled to Turkey, a country not often thought of as a modern destination, but one rich in history. They traveled with a tour of about 40 people and 1 guide. The people were all from Canada, the U.S., or Australia, but ranged in nationalities. “We counted around 15 nationalities ranging from Bosnian, to Argentinian, to Palestinian, to Indian, Slovakian/Czech,” explained Rachel. She said they covered 2,200 miles in 13 days by bus around the western half of Turkey. “We started in Istanbul, the only city in the world that straddles two continents—Europe and Asia. We then drove down the coast of the Aegean Sea and visited the ancient city of Troy, and the battlefields of Gallipoli from WWI. Next stop was Pergamum, an ancient city started by Alexander the Great as a military base. Then we visited the ancient city of Ephesus, as referenced by Paul in the bible. The Pamukkale hot springs and city of Hieropolis were next, a UNESCO world heritage site. “The next stop was the region of Cappadocia, with a stop at a Turkish carpet factory. In Cappadocia we saw the famous volcanic rock formations, caves, and underground cities.” That’s where they took their photo with The Post. In the background you can see many decorative blue eyes hanging from the tree. Those are called “evil eyes,” and are to protect people from evil, or bad luck. It is a popular souvenir in Turkey, and many shops and homes have them. Their last stop before heading back to Istanbul was the capital city of Ankara and an Ottoman Hittite museum. Back in Istanbul, they cruised the Bosporus straights between Europe and Asian and visited the well-known spice market there. “We had a great time,” said Rachel. Thanks so much for taking the Post with you!